Human history has been marked by technological innovations so significant, they ushered in an entirely new era. Think Stone Age, Bronze Age, Iron Age. Or more recently, the Age of Discovery, the Age of Enlightenment, the Machine Age, the Information Age. In his new book, The Age of the Customer, Jim Blasingame argues that we are undergoing such a shift right now. And its implications are huge for anyone in business. Blasingame divides human economic activity into two Ages: the Age of the Seller and the Age of the Customer. The former began when early people first started trading with each other. The latter, Blasingame pinpoints to April 30, 1993—the date the Mosaic web browser was introduced, opening up the Internet to the average person. • “Virtually everything a business can sell has become a commodity. • It’s much less frequent for a seller to introduce an innovation that is so unique that it provides any level of control over customers. • “The entire universe of human knowledge—including information formerly controlled by sellers—is now generally available to the entire universe of humans. 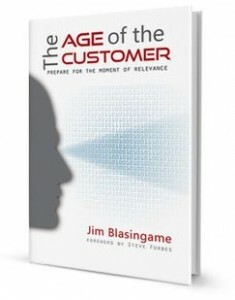 The Age of the Customer is well written, with plenty of stories to illustrate Blasingame’s points. The book is peppered with graphs, quotes and “Blasingame’s Laws”—pithy nuggets that are worth the price of the book themselves. Every new age has presented challenges and opportunities. Those that fail to adapt suffer, while those who take advantage of the new opportunities thrive. Think of The Age of the Customer as your guidebook to higher sales in this new—and exciting—age. Are You Thanking Your Customers or Insulting Them? 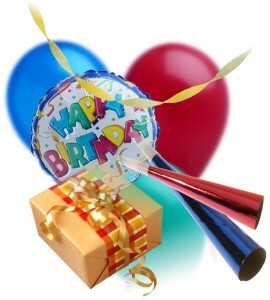 I recently celebrated a birthday, which I tend to do about every year or so. In addition to the cards, phone calls, texts and Facebook messages from friends and family, I also received numerous e-mails from businesses I frequent. Each e-mail bore warm wishes for a wonderful day and presented me with a special “gift”—a coupon for a free desert with the purchase of an entrée, a buy-one-get-one free offer, or a discount off a regular purchase. I get similar e-mails from time to time with subject lines like “Thank you for your loyalty” or “A Special Gift for You.” The message inside always expresses the company’s gratitude for my business, and as a token of that gratitude, they’d like to extend me a special offer. Which again is always some type of discount. A discount is not a gift! A discount offer is a sales pitch. Now, there’s nothing wrong with offering an existing customer a discount on a future purchase, per se. But saying you want to “thank” or “celebrate” a customer by getting them to buy more is insulting as hell. I would rather you just ignore my birthday and my loyalty than send me sales come-ons disguised as gifts, because the self-servingness offends me. And guess what? It offends your customers as well. If you really want to thank your customers for their business, send them a real gift. Something absolutely free, that requires no purchase or obligation. It can be your product or service. It can be a gift card. It can be something unrelated to your business. It can even be a donation to a charity in their name. And when your customers feel that you truly appreciate them, they return more often, spend more money, and tell more people about you. So stop insulting your customers. Start thanking them instead. Would you like to create a record sales year? You can! Although you can’t do it alone. You need people to provide you with information, advice and feedback. Which begs the question, where can you find them? Listen to my appearance on Breakthrough Business Strategies Radio with Michele Price. In this nine-minute segment, I share five resources where you can get all three of these critical elements. 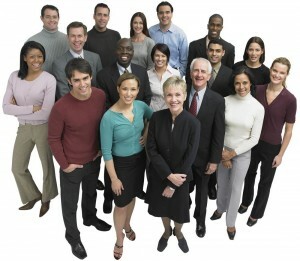 Tap into one or more of them, and you’ll be able to seriously boost your sales!